There are four of them in the world, made from olivine being ground up into smaller and smaller pieces. Really neat! Yep, this is pretty much what I would do when drunk in Hawaii. Which happened, once. After a blue drink. So, I'm allowed. I can't say I particularly like the sensation of drunk or even tipsy. I especially do not like it when walking back to the condo. With Mom along side me, though, it was amusing. We stopped at a rocky beach and watched the ocean for a bit. I stacked rocks. 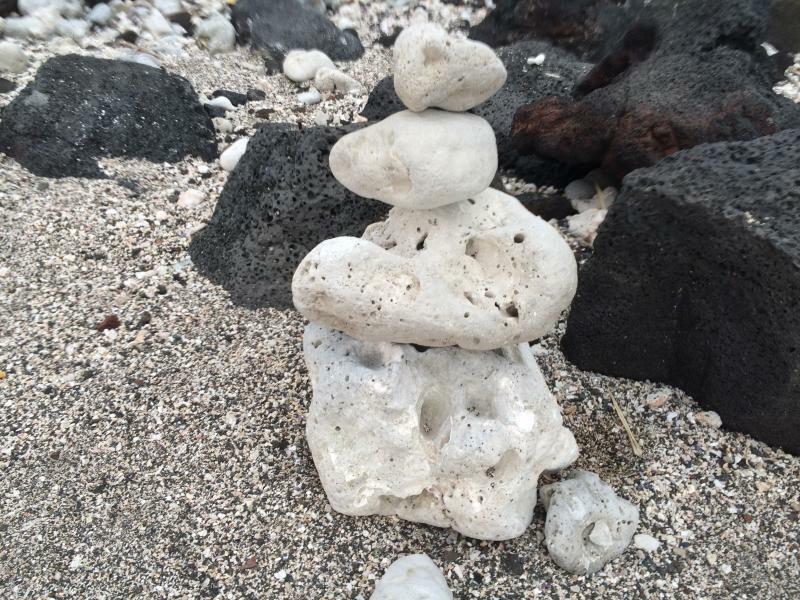 I have no idea why I stacked rocks, or why I can stack rocks when drunk so much better than I can when sober, but there you go. What I do when drunk in Hawaii. When we were walking around in the Volcano national park, we stopped in the restrooms at some part of the park. YES, I KNOW. SHOCK. After using the toilets (what? everybody does, we're not special there), I went to wash my hands. I turned on the water, wetted my hands, squeezed out soap, lathered up my hands, the went to rinse. I happened to have turned on the water at the precise flow necessary for the water to come out of the faucet as a tube. The temperature was close enough to skin temperature and the water flow so smooth that, hands in the water, I couldn't feel the water. I could feel the pressure of the water, but could not discern by touch that I had water flowing over my hands. It was a fascinating sensation, almost like a glass rod pressing on my hands. After toying in the water for a bit and rinsing my hands, I called Mom over and suggested she do the same.